For today’s recipe I wanted to make something Colombian, something that does not take a lot of time to make and something that can be served at any time during the day. 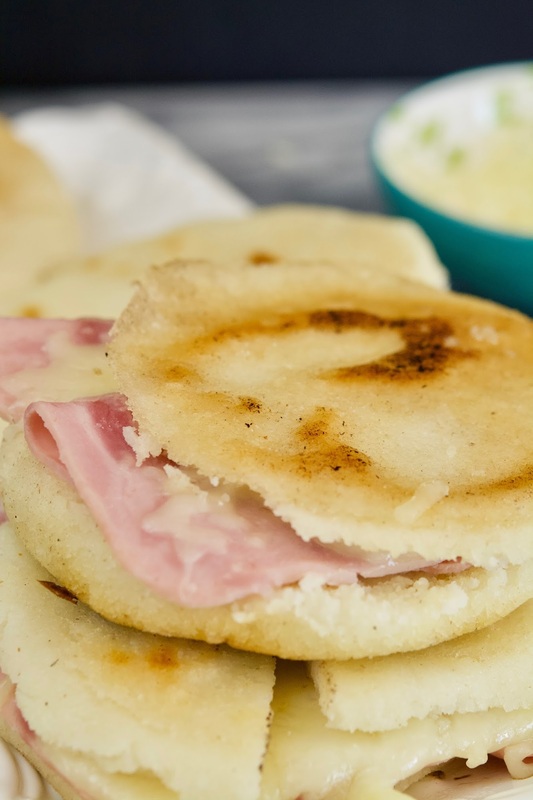 So, that’s why today we’re making arepas filled with ham and cheese. 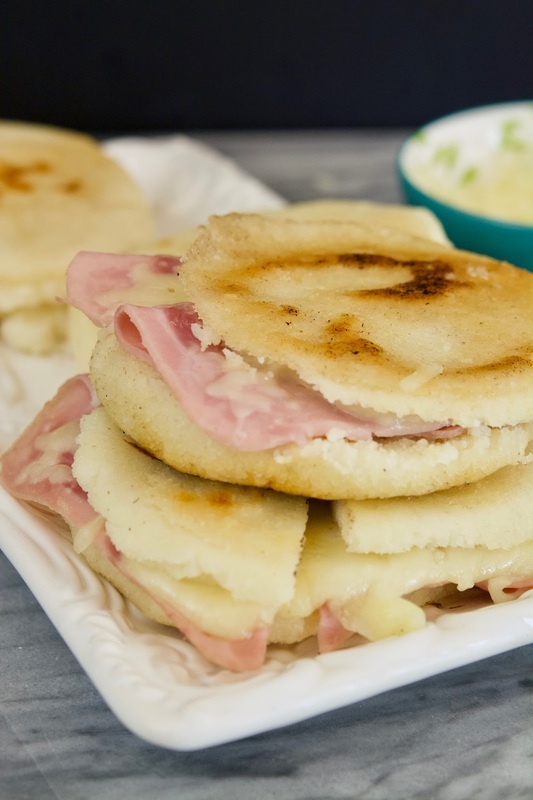 You cannot get more Colombian than an arepa and these seriously only take between 15-20 minutes to make. I usually make them for breakfast but also for dinner if we feel like having something light and not too complicated. I get asked this question a lot and that’s “which brand of pre-cooked corn meal do you need for making arepas?” The answer is, any brand as long as as the package says “pre-cooked” cornmeal, otherwise, it will not work. The most popular brand you will find, especially here in the US, will be Harina P.A.N.. Now, is it my favorite? I can honestly say that it has not been for the past 2-3 years and the reason is because the texture is not what it used to be. Plain and simple. I don’t know what they did to their formula or to the way they used to make it but sadly, it’s no longer my favorite brand. So, which is now my favorite? Without a doubt, hands down, Doñarepa. Man, that pre-cooked corn meal is awesome! The texture is super fine and the arepas and empanadas come out amazing. If you want a crunchy, delicious dough for your empanadas, then that’s the brand you should use. The bad news is, I rarely find it at the store where I usually get my Colombian groceries. Boo-hoo! Place the warm water in a large bowl and slowly add the cornmeal. Season with the salt and knead the dough until it's smooth. If you notice that the dough is still dry, add more warm water little by little until you get a smooth texture. Divide the dough into 4-5 big pieces. Shape each piece into a big ball and then flatten it with you hands to form a disc that is about ½ inch (1¼ cm) thick. If you get any cracks around the border, you can flatten and seal them with your fingertips. Melt a little bit of butter in a large pan or griddle over medium high heat and grill the arepas for about 5-7 minutes per side. Remove them from the pan and let them cool for a bit. 4. Cut the arepas in half with a serrated knife making sure not to cut them all the way through. 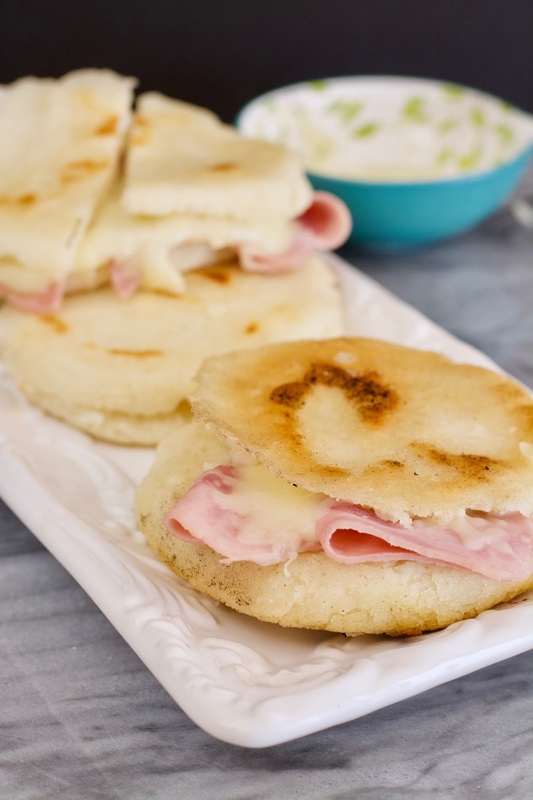 Place 2 slices of ham inside of each arepa with 2-3 tbsp of shredded mozzarella cheese or 2 slices of mozzarella. 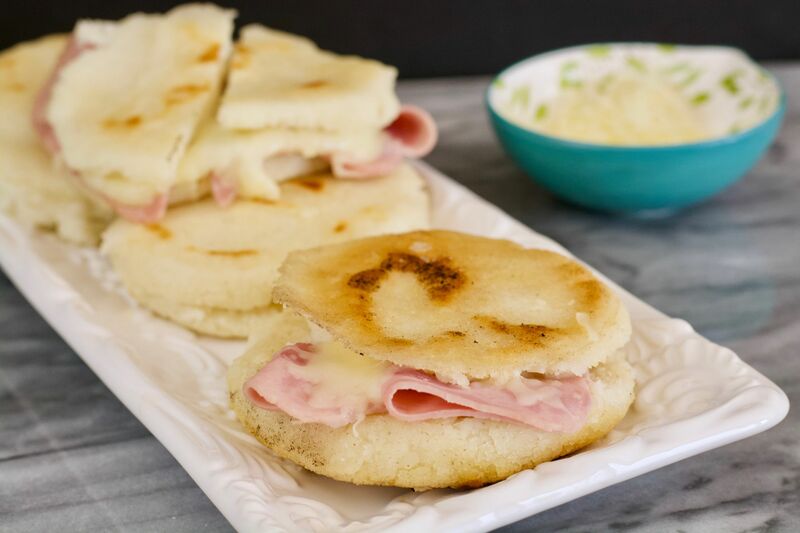 Lower the heat to medium, place the arepas back on the pan or griddle and cook until the cheese starts to melt. Serve immediately.